The exstensive use of transformers in an electrical generation and distribution system has created noise problems by their necessary location. From a noise viewpoint, the ideal electrical substation would be sited far away from populated areas. This, unfortunately, is not always possible because of the scarcity of suitable land and other economic design considerations. Also, the problem is likely to increase rather than decrease because of the modern tendency to build much larger transformer units to overcome some of the economic problems. It follows, therefore, one of the many aspects a designer must consider is the problem of noise. 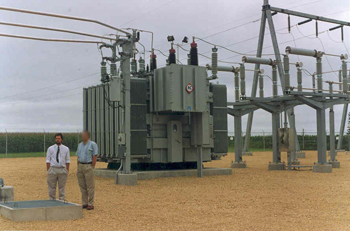 A method often employed on substation sites is to build a screen wall around the transformer, the usefulness of the wall being mainly dependent upon its height and mass. Only small attenuations can be obtained from such a relatively expensive treatment, and this is particularly true when comparing noise levels some distance away from the screen wall. Much more effective than the screen wall is total enclosure in which the noise energy can be contained. Enclosures introduce problems in maintaining adequate electrical clearances for high system voltages. That all transformer connections are made as flexible as possible. The main concern with the total enclosure method is to ensure that adequate cooling air is provided at the transformer radiators and tank surface. For larger transformers, more cooling air is needed and can sometimes be obtained by drawing cooling air into and out of the enclosure by means of fans. A method of overcoming the large aperture problem, as well as the fan noise, is to use tuned silencers. The following Acoustical Perforamance is subject to site inspection by an ASI Aeroacoustic Engineer prior to quotation. Contact ASI Aeroacoustics for current pricing and delivery lead time.